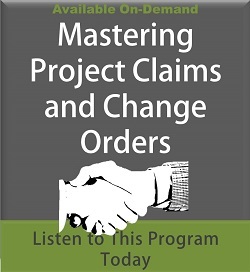 Download this four-part series that dissects the numerous complexities that lead to claims on construction projects. Attorneys presenting the sessions examine federal and private contract clauses that govern the ability to recover costs and time, including the roles and dynamics of the project staff and the owner's team. 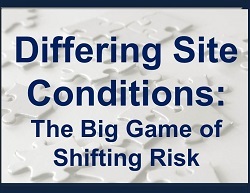 They shed light on solving the technical specification conflicts that typically cause claims. The series will help you understand various rights and remedies you might have to recover all costs and time related to the changes. Owners and contractors alike should have their teams sit in on these sessions to be able to quickly resolve potential costly problems at the least expense to all parties. This recorded webinar identifies the top ten mistakes owners make that cause claims, as well as the top ten contractor mistakes that give rise to disputes. With each, the expert presenters will share practical advice on how to avoid such mistakes. This recorded program is designed to show owners and their representatives how disputes can be avoided at the end of the project through upfront dispute resolution planning during the design, bidding and construction phases of a project. The presentation discusses four types of reviews that should be applied to contract documents; the need for a comprehensive scheduling specification and payment for changes article; and much more. Successful negotiations are not just about bargaining table tactics, but are grounded in proper proposal preparation, company goals, knowledge of the process and understanding your opponent. This 90-minute presentation reviews the steps to prepare for a negotiation meeting, present tactics for negotiating forward pricing and large claims where amounts are usually negotiated item by item and review available negotiating techniques. This session discusses over 40 alternate methods for resolving disputes when they cannot be negotiated by the parties. The intent of these methods is to promote a decrease in expensive litigation or arbitration costs through the increased use of mediation, partnering, dispute resolution boards and other methods. All construction projects have challenges during performance, but some have problems of such magnitude and extent that the entire project becomes troubled, leaving all project participants facing potentially ruinous financial risk. Costs skyrocket, delays render schedules nearly meaningless, and cooperation gives way to disputes and ill will between project participants. 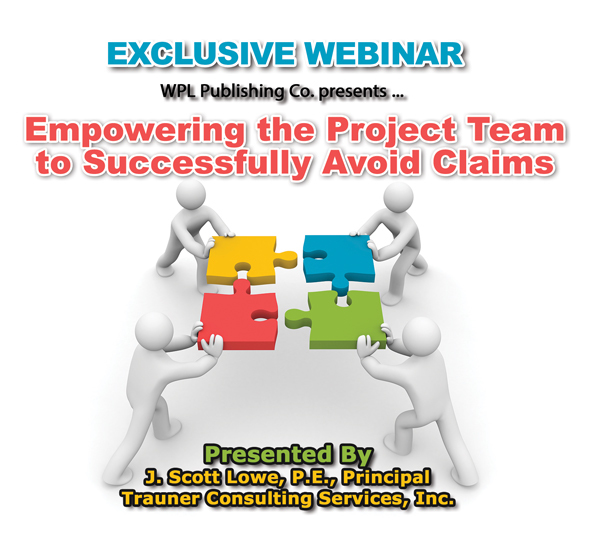 This webinar will explore the problems that can arise on troubled projects and outline the steps that can be taken to survive troubled projects. Don’t sign your next contract until you have a thorough understanding of important construction contract terms and strategies you can implement to protect your organization. 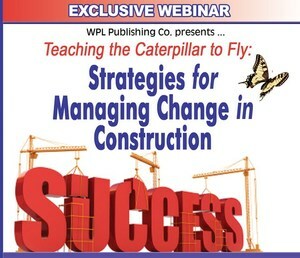 Preventative action in your construction projects could mean the difference between success and failure! Sometimes there is no clear-cut section to establish a benchmark, or to separate the increased actual costs. 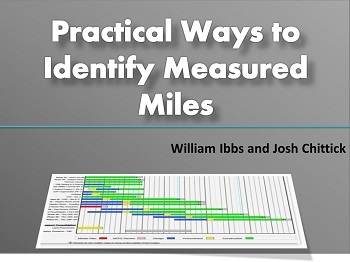 In an excellent paper on the subject, William Ibbs and Josh Chittick provide a review and synthesis of project management literature and court and appeal board decisions to present practical considerations in the identification and application of measured miles. The intent is to help contractors, owners, consultants and other parties step through a logical process for preparing and presenting a credible measured mile analysis. 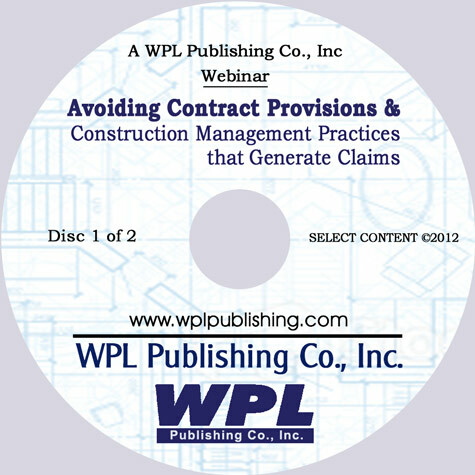 Construction Contract Claims, Changes, and Dispute Resolution is the go-to handbook for those involved in the prevention, preparation, management, and resolution of claims and change orders on construction projects. 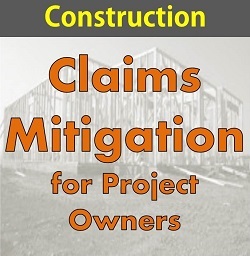 For more than 40 years, engineers, contractors, owners, and construction managers have turned to this practical guide and its straightforward, clear approach to solving challenges in construction claims and changes. 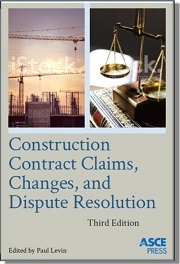 Thoroughly revised and completely updated, this third edition adds the expertise of more than 30 attorneys and construction consultants who are recognized authorities in the field. 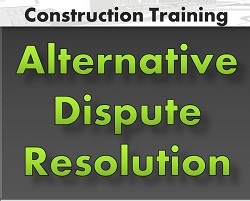 Their contributions merge principles of construction law with practical advice. We all want to avoid claims, but too frequently our contract provisions and construction management practices actually work against us and lead to the generation of claims! The key to successful claims avoidance, once the project contract has been executed, is to provide the project team with the tools it needs to identify problems quickly, measure impacts reliably, and price those impacts fairly in order to resolve changes as they arise and, thus, avoid claims. Although all contract provisions aim to avoid claims, in reality, some of the most significant claim avoidance-related provisions actually generate claims. 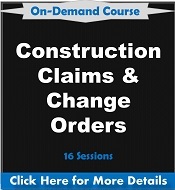 This recorded session will identify contract provisions that lead to claims as well as construction management practices that encourage claims. The speaker offers practical solutions and alternatives to these provisions and practices. Project success can be measured by delivering the required product on time, on budget and at the client’s expectation. For many construction projects in today’s competitive marketplace, completing on time and on budget is challenging. Scope creep is a term used in the construction industry to define the inevitable tendency of projects to expand beyond their original intent and is often described as a cause for construction projects experiencing cost and schedule overruns. In the planning stages of any construction project, owners, designers, and contractors each have a vested interest in defining the full project scope and developing an accurate budget. However, as the project progresses, scope creep can go unnoticed, gradually work its way into a project’s scope as expectations evolve and result in significant negative impacts. 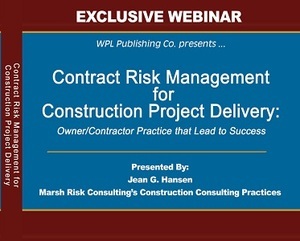 This program identifies contract specifications and construction-management practices that encourage claims. The speaker identifies and discusses how these specifications and construction-management practices, in real-life situations, can lead to the generation of claims. 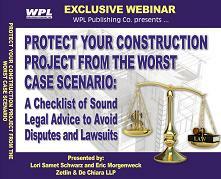 This WPL Publishing webinar reports on what the newest trends are in construction claims and disputes as well as offers advice to industry professionals about how they can minimize problems resulting from these trends. 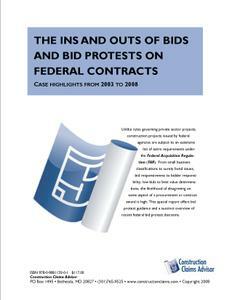 During the recession, the number of projects and construction companies declined even though the number of claims rose. 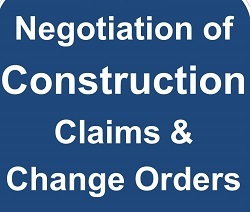 From this growth, several trends have developed, including declining construction dispute values accompanied by increasing durations, court and appeals board decisions limiting damage recovery, increased use of false-claims allegations in response to contractor claims, and contractors trying to create new forms of claims. 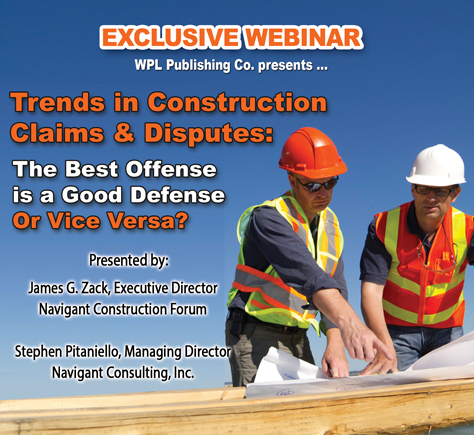 The webinar explores these growing trends and ways to mitigate or avoid their negative impacts on construction claims and disputes. 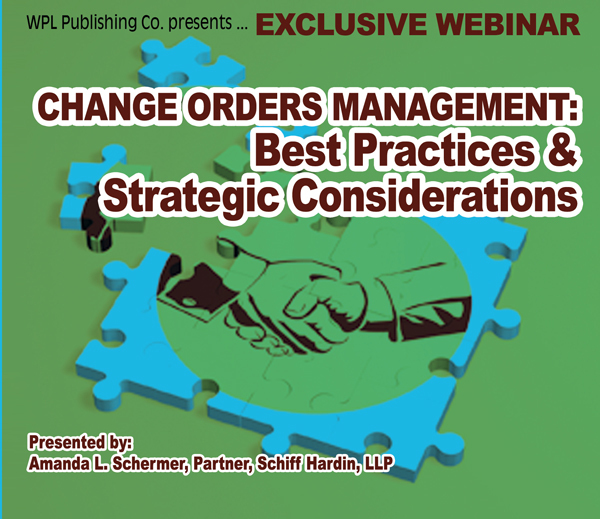 Watch this information-packed recorded webinar to understand best practices that will help your company successfully manage change orders to make sure you come out on top. 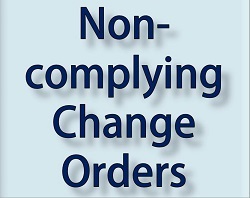 You will learn about the contractual basis for change orders, their impact on your schedule, contract management, documentation, change management and much more. 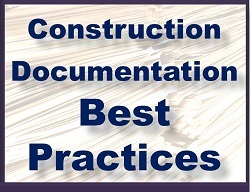 When asked about the most common causes of construction claims, owners and contractors will likely recite a lengthy list including changes, delays, site conditions, lost labor productivity, etc. However, a recent global survey of the top five causes of claims found that contract administration issues are the largest cause of claims. The Navigant Construction Forum™ has determined that contract administration issues are not caused solely by one party to the contract but rather are caused by both owners and contractors. 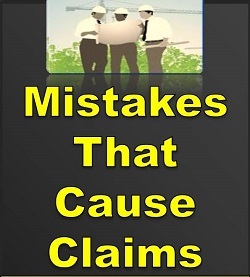 This presentation identifies the top 10 mistakes owners make that cause claims, as well as the top 10 contractor mistakes that give rise to disputes. With each, the expert presenters will share practical advice on how to avoid such mistakes. Change affects every aspect of human endeavor, and construction is no exception. A recent survey of professional engineers identified change as the major cause of project failure. The term - Change Management - suggests that change can be controlled and we can tailor our response to change to minimize the risks of failure and maximize opportunities.